The Magic Flute as a silent film? Not such a mad idea given that Strauss recomposed his score of Der Rosenkavalier for live performance for just such a project. Barrie Kosky’s take on Mozart’s final opera is instead inspired by the golden age of silent film – Tamino is dressed as a 1920s matinée idol, Pamina as Louise Brooks, Papageno as Buster Keaton, Monostatos as Nosferatu. 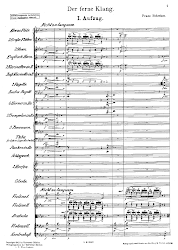 And rather than the dialogue being spoken, it is displayed in large letters across the stage-wide screen in the manner of silent-film captions, accompanied by a Hammerklavier playing various snippets of Mozart keyboard music appropriate to the words. 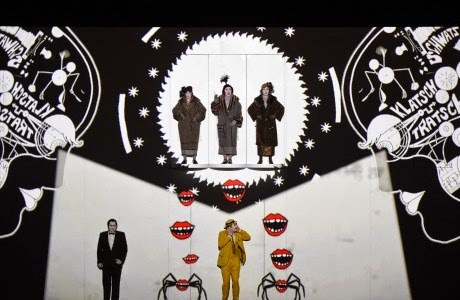 But this tribute is just one aspect of the concept, originally created for the Komische Oper, Berlin, in 2011, restaged in Los Angeles in 2013 (see trailer below) and which is now in the repertoire of the Deutsche Oper am Rhein. 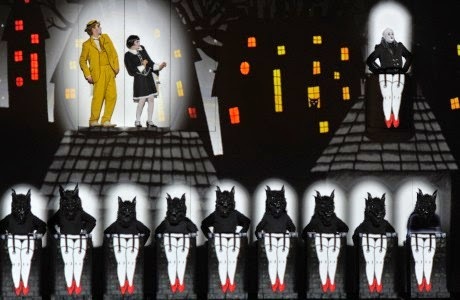 Kosky collaborated with British theatre group 27 and its founders Suzanne Andrade and Paul Barritt, who effectively animated the whole opera – what we have is a two-and-a-half-hour cartoon in which the singers interact with a constant array of images moving around them. At this performance in Duisburg, it looked like a miracle of timing and coordination, and it would be interesting to know how much scope for ‘performance’ there was in the actual mechanics of the projection (see below). 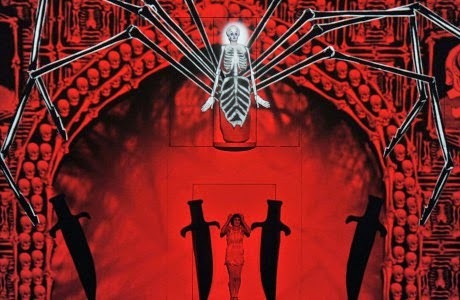 The quality and creativity of the animated images portrayed a hypnotic imaginary world, one where the Queen of Night is a giant spider, Sorastro’s domain is characterised by mechanical, cyborg-like animals and the trials by fire and water can place the hero and heroine in the range of a flame-throwing head and at the bottom of the sea respectively. It is all done with wit and charm, and a healthy amount of cartoon-inspired slapstick, particularly surrounding Papageno – his constant companion of a little black cat who does his bird-catching for him; his cheesy grin that goes AWOL when he is silenced by the Three Ladies (shades of Terry Gilliam’s Monty Python images here); and his perfectly choreographed drinking of cartoon wine from a pink elephant’s trunk and subsequent visualised burps. Elsewhere are Monostatos’s army of hounds, straining at the leash to get at the imprisoned Pamina; the cat’s defensive pose towards a vicious dog; ‘running-on-the-spot’ chases; and waste-high baffles allowing the legs of Monostatos and his minions to turn into cartoon dancers’ legs when Papageno’s music box bewitches them. All that was missing in the imagery was a magic flute, but the implication here is that it is music itself rather than an instrument that provides the plot’s safety valve. Also missing is any suggestion of Freemasonry, but Kosky excuses himself by stating that he has no interest in it and that its tenets as presented in the opera are more generally sought ideals of Reason, Wisdom and Truth. If this suggests a wholly lightweight concept, then one should remember that the opera was created as an entertainment, part pantomime, part moral fable, though one darker element that this presentation goes out of its way to bring across, aided by the silent-film-era ethos, is the plot’s sexism, even misogyny – its racism is at least avoided by reinventing Monostatos as a straightforward pantomime villain. Earlier, I wondered about the mechanical logistics of a live presentation of all this material. The thought was set off once I had experienced the grossly staid account of the overture, performed before a red theatre curtain before the imagery had even erupted in front of our eyes. Things probably weren’t helped by Theater Duisburg’s very dry acoustic, but where were the ebbing and flowing of phrase, where the instrumental colouring, where the rhythmic drive that expresses that sense of anticipation for curtain-up that only Mozart’s overtures seem to do? I feared that under the baton of Taiwanese conductor Wen-Pin Chien the performance had died before it had properly begun – and the lame phraseology and simple lack of idiomatic style impeded the purely musical side of the evening as a whole, as if the cartoon entailed conducting to a click track to keep in time (though I saw no evidence of this). The Deutsche Oper shares productions between its two theatres in Düsseldorf and Duisburg, but uses local orchestras for each – with only three performances in a long run scheduled for the junior house in Duisburg it may have been down to an overall lack of rehearsal time for the Duisburg Philharmonic in an atmosphere of threatened cutbacks for this part of the company. Thanks goodness for the singers, who between them rose above this prosaic music-making from the pit to add character, musicality and – for all their cartoon-like portrayal – Mozartian humanity. Principal among them was the lyrical Tamino of Jussi Myllys (the convincingly youthful Sali in last summer’s Frankfurt production of Delius’s A Village Romeo and Juliet,reviewed here). Apology was given for the Pamina, Heidi Elisabeth Meier, who was suffering from the onset of a cold, and it is true that her high singing gave lie to the fact that she has been singing the role of the Queen of the Night in other performances of the run, but there was little sense of vocal frailty in general and both her tone and vocal portrayal were warm and congenial. The evening’s actual Queen, Antonina Vesenina, sounded a little dry in her Act I aria, but for ‘Der Hölle Rache’ in Act II she had all the necessary agility and accuracy for the role. Shorn of his spoken dialogue, the Papageno of Dmitru Vargin perhaps made less of an impact than is normal for the character, but his singing was lithe and warmly focused, and his stage interactions with his cartoon cat were a constant delight. Florian Simson’s flexible tenor made for a convincing Monostatos, Torben Jürgens brought Wagnerian weight to the role of the Speaker and Bogdan Taloş’s elegance of line gave Sarastro’s interjections due solemnity. They were complemented by strong trios of Ladies and Boys and a robustly chorale-ing pair of Armed Men.